Just think of this as a few pages from my diary… Because it is. It almost didn’t happen. Scheduled to depart for Dallas on Friday, March 15 via United Airlines Flight #1447 at 7:59 pm from Newark Liberty International Airport, I don’t actually leave until 1:33 pm on Saturday, March 16 ET. I knew I’d miss the weigh-in between IBF welterweight champion Errol Spence Jr (25-0, 21KOs) and Mikey Garcia (39-1, 30KOs) AT&T Stadium in Arlington, TX the day prior, but I didn’t anticipate not being near the home of the Dallas Cowboys shortly thereafter. Having already chronicled their readiness for war on the previous page, this one was supposed to be devoted to peace. Exactly thirty years ago on a Wednesday, under the sign of Pisces, I was a US youth ambassador from the state of New Jersey dispatched to the Soviet Union having won an international essay contest on the subject of Peace. It is classified a literary ‘Work of Art’, and at 17 years of age, I am considered the nation’s best advocate for a world of waving white flags. The new US president was George H.W. Bush, a man I considered to be the literal ‘Art of War’ who needed to be stopped. He knew Generation X was coming of age, and most likely wanted a look at potential adversaries who “prosed” a threat in the future. 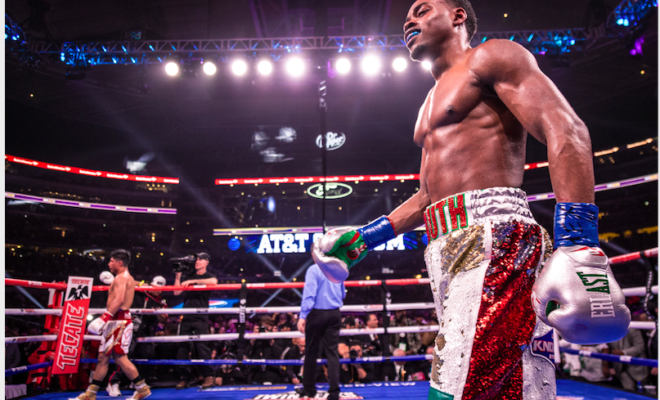 Errol Spence Jr has not yet been conceived, and Mikey Garcia is a terrible two year-old with no thoughts of ever being stopped. “How far away is Dealey Plaza from here?” I ask. A Haitian man by the name of Patrick is my Lyft driver from the airport, and he assures me that it isn’t too far away. But Jennifer, a girl I remember as feisty and freckled, is a little remote from here. An L.I. native living in The Hamptons, she represented the state of New York during those memorable youth peace talks in Russia, and I’ve not seen her since we tearfully departed each other as idealistic kids from JFK International Airport in New York upon our return in early April 1989. Now, realistic adults still full of youthful idealism, we were supposed to reunite and have dinner at a trendy spot in beautiful downtown Dallas last night, before rising to revisit the scene of our country’s darkest and most inexplicably unsolved crime: The assassination of JFK. To commemorate that event in my own way for Spence Vs Garcia, I’m wearing a t-shirt capturing a portrait of a young, unsuspecting Notorious B.I.G and a duplicitous Jay-Z entitled “Reasonable Doubt”. On any chessboard, only a King orchestrates the killing of another King, usually, as a result of his devastating Queen. Be that as it may, upon surveying this scene, that almost makes a pink clad Jackie the Queen of LBJ on the board while holding a Trump card for Marilyn Monroe. The original “Black Widow” in this Marvel universe, Scarlett Johansson couldn’t carry her Chanel purse. Art is the only way we can escape and run away without leaving home. It allows us to see virtually everything as beauty, and thus, we can become it. For an artist, it’s never really about what we see, but what we make other’s see. AT&T, in artistic expression defined, represents an A++ on the report card. 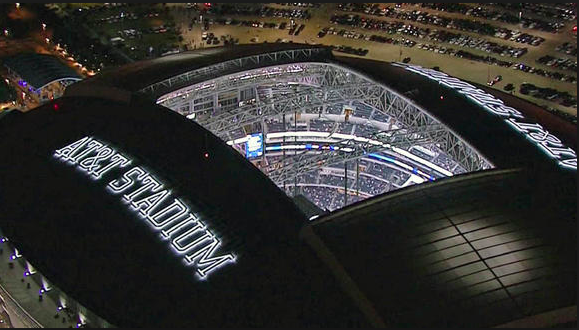 In terms of architectural structure, AT&T Stadium is absolutely flawless. Upon approaching arrival, it appears as if some sort of mothership from the future; while actually getting there evokes an aura of majesty. It is so beautiful, that if this venue was a woman, it’s a resurrected Aaliyah with long flowing locks, gracing a dress made of diamonds, sapphires and pearls. It is an incandescent place of coronation, designed for champions of the highest order– which is exactly why we were all there. 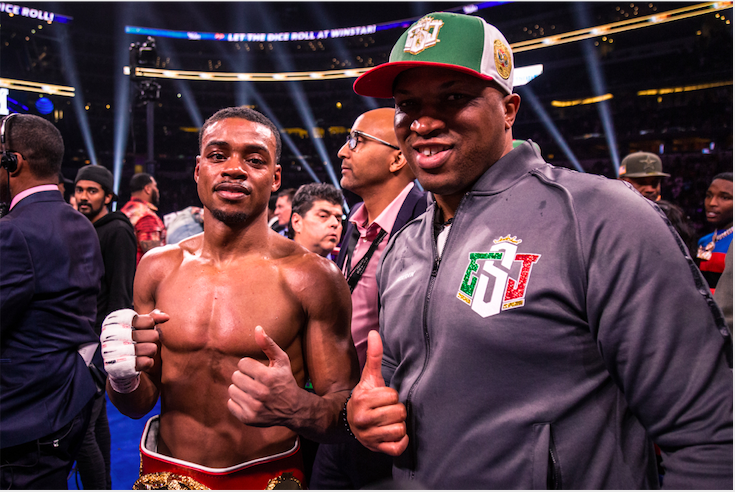 It cannot be overstated that Errol Spence Jr Vs Mikey Garcia, at this particular venue, was not really about the IBF welterweight championship, in as much as it was about the championship of a coming new era. In time, we will understand that superfights carry with them a much deeper meaning than the public understands. Athletes can shape pop culture and/or ideology; persuasion or orientation; or even whether or not you are hateful or loving. Thus, Spence Vs Garcia was more or less a spiritual battle involving two very different men. We know by now that Mikey Garcia was supported by Latin legends such as Marco Antonio Barrera, Juan Manuel Marquez and Erik Morales. All during fight week, he appeared to have the support of Panamanian icon Roberto Duran as well. In a significant poker tell of who they are (or not, depending on your perspective) the three biggest commercial draws in the sport of boxing since the time of Muhammad Ali who wielded the most influence on urban pop culture are the following: Sugar Ray Leonard, Mike Tyson and Floyd Mayweather. All three of them are black. All three of them supported Mikey Garcia. But none of them more egregious in betrayal than Mayweather; for in the time honored tradition of boxing involving the passing of a torch from one legend to a budding one, Floyd simply blew out the flame and handed it to Manny Pacquiao, who awkwardly attempted to relight it at the end. Pacquiao Vs. Spence is a good fight, but it doesn’t make any sense. 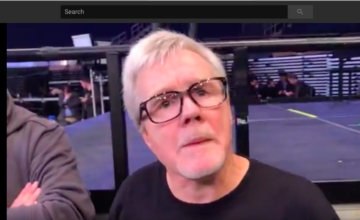 One involving “Money” does, for all any one of the 45,725 fans in attendance (who lustily boo’d “TBE” or “The Best Ever”) had to do was examine the apoplectic insouciance of a prowling Mayweather in the ring during the introductions. It’s plain to see that things are frosty between Spence and Mayweather, not helped by [Vol.III] of this promotional series, which mentions the Spence dominance over Mayweather during very real sparring in Spring 2013, something Mayweather Promotions CEO Leonard Ellerbe took issue with in a Radio Raheem “Seconds Out” segment, in which he – with nostrils flaring into the shape of the New Orleans Saints logo – subliminally referred to yours truly as an “idiot” (This, for merely suggesting in a piece last year that only Vasyl Lomachenko could’ve beaten a 130lb Mayweather). 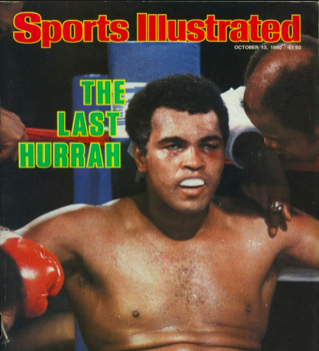 The reality is, it happened, just as an upstart Larry Holmes happened to an early 1970’s Muhammad Ali. It was brutal and remains difficult to watch, but an ancient Ali didn’t just hand a blown out torch to Joe Frazier to give to Holmes, just as an ancient Holmes faced the epitome of “Iron Mike” with aluminum. I watched a bittersweet Ray Leonard take a terrific beating from “Terrible” Terry Norris in February 1990 at Madison Square Garden when Errol Spence is not quite a newborn. But boxing had already long given birth to this form of tradition, much in the way a pride of Lions conduct themselves on the Serengeti. I guess Mayweather believes in the Cheetah. I told anyone who would listen to me that this fight was a progressive slaughter– and it was. Positioned by promoters with a perfect mid row view of this no-contest from ringside, I’m very surprised by the resolve of Garcia to endure and wince throughout. Mikey, entering the ring in his trademark rodeo hat, exited looking like he’d been Redskin’d by a defiant Dallas Cowboy angry with Washington and all Uncle Toms in the form of Errol Spence. Mikey took the beating of his life, making trainer Derrick James look very much like a prophet. Before the fight he’d stated that Garcia’s corner and family would have to make a decision regarding just how much punishment they allow Mikey to take before stopping the fight. By allowing it to go the distance, they’ve basically introduced Garcia to the finished line. 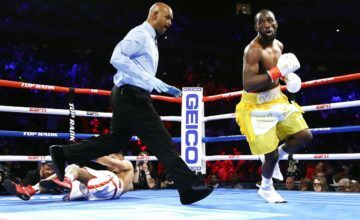 Regis Progais would most likely destroy what is left of him, and Vasyl Lomachenko– who in fairness should be facing Terence “Bud” Crawford after a defense against Anthony Crolla, would arrogantly dismiss a damaged goods package of Mikey Garcia. Somewhere, “The Bobfather” lit a marijuana cigar so pleasing to the pallet that not even a time capsule could match. Only an act of God could force me to miss a post fight press conference I would’ve never missed outside of an extreme 9/11 event. But I receive an urgent call from Jennifer three decades in the making and I have to take it. In the process, I have a chance to further explore the neverending cavernous spectacle of Jerry Jones’ masterpiece. This place is simply extraordinary. I wind up in front of the A side lobby, where security allows me to talk privately in a vestibule. There’s a calling; a certain glow in the sky and I’ve gotta go. As I make my way out to the fast approaching car, I see Al Haymon’s right hand man, Sam Watson, as we exchange waves of mutual admiration and reciprocated smiles. Some of us are more than men. We’re ideas that endure to open doors for discontent. Gotham awaits, deep in the art of Texas.